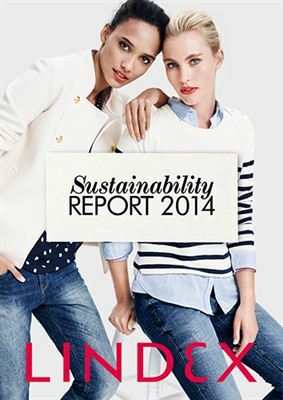 Today, Lindex is publishing its tenth sustainability report. During the past year, 900 million liters of water was saved by Lindex suppliers through cleaner production projects in India and Bangladesh. Lindex also became a partner to WaterAid as an extension of their water related sustainability work. “Lindex suppliers´ production operations throughout the supply chain are significantly dependent on access to water, and we will continue our collaborations and projects with suppliers and other stakeholders where we are implementing responsible water usage”, says Ingvar Larsson, CEO at Lindex. In 2014, 16.3 million garments were made by sustainable materials which accounts for 22 per cent of the total collections. By 2020 the goal is that at least 80 per cent of Lindex garments are made of more sustainable fibres and all cotton will come from sustainable sources. “We are working steadily ahead towards our sustainability targets and our aim is that all garments are produced using more sustainable processes with less energy, water and chemicals and producing less waste”, says Ingvar Larsson. With the aim to empower factory workers in their supply chain, Lindex has now reached 8,000 female factory workers with education about their personal health. In collaboration with QuizRR, Lindex are now developing a tool that will educate factory workers about their rights and responsibilities. 2014’s yearly collaboration with the Breast Cancer Foundation was a success. “Our design collaboration with Jean Paul Gaultier for the Breast Cancer Foundation was a success. Together with our customers, Lindex donated 1.4 MEUR to cancer research and for this we are of course both proud and grateful”, says Ingvar Larsson. During 2014 Lindex also started collecting textile for reuse and recycling in 50 selected stores in Sweden. This was done in cooperation with the app Cirqle and the organisation Myrorna, as a part of the aim to close the material loop. ** This post first appeared here. This entry was posted in Brands and tagged Lindex, Sustainability Report, Sustainable Products, Water.